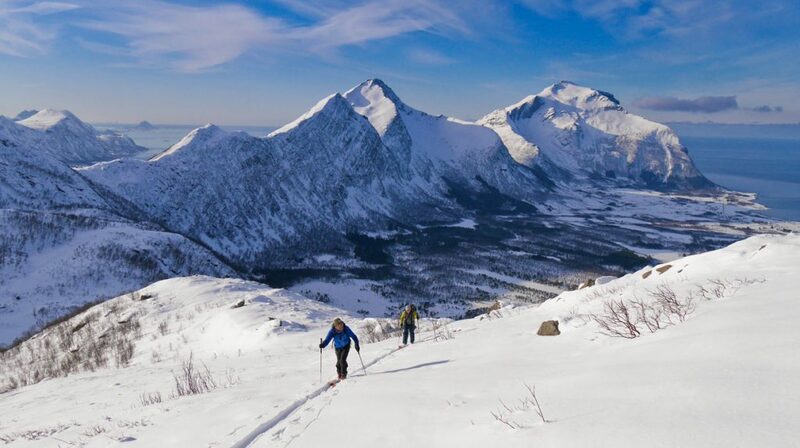 Our Bodo Ski Touring holiday explores this stunning coastal region of Arctic Norway. 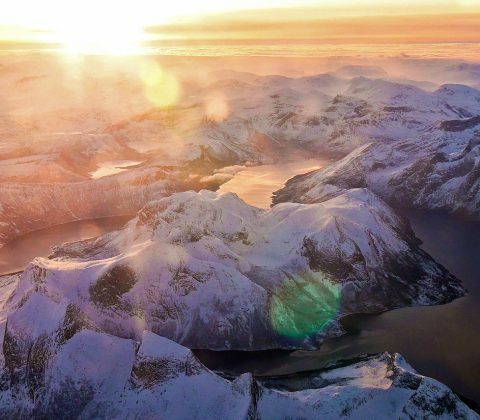 Little visited by skiers, the area offers a very diverse range of touring terrain; beautiful fjord scenery, coastal islands and inland alpine peaks – making it a very reliable location in a range of conditions. The area also boasts other natural attractions that we’ll be able to visit, including the Saltstraumen which is the worlds’ most powerful tidal maelstrom. We stay full board on this trip, at a comfortable hotel with an excellent spa to relax in each evening. 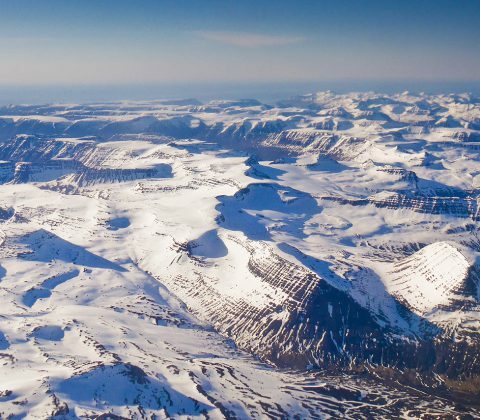 I loved the area – stunning scenery and wildlife (we saw moose, reindeer, sea eagles, ptarmigan) and masses of great skiing. It was a quiet area in winter and the lack of other skiers was a big plus. The hotel was comfortable and friendly, and the food was great (plenty of it too). I really valued Al’s prep work recce-ing the area – he always had a range of options and routes in mind for any given day which meant we could make the best of conditions. And I enjoyed skiing with him – on the mountain I had a lot of confidence in his judgment and skill as a guide, always planning a route to the abilities of the group and willing to share his knowledge. All in all, another great trip to a great destination. We stay in a comfortable hotel right next to the Saltstraumen maelstrom, which offers full board accommodation (breakfast, packed lunch and evening meal) each day. This is a perfect location for accessing the principal skiing regions in the area, with good touring just a few minutes away, access to islands and fjords along Norway’s most scenic coastal road, the famous Helgalandskysten, as well as higher inland peaks around the Svartisen National Park. The summits in the region are typically 800-1300m high, so ideal for day touring and importantly, there is also access to a number of different micro climates; with both coastal skiing and access to a drier, colder, continental snowpack further inland. Given the variability of Norwegian weather, this is a useful aspect for making the best use of current weather and snow conditions. Feb-March is a great time to visit, with plenty of daylight, low temperatures for powder and a good chance of seeing the northern lights. This trip travels on friday out/friday return, to make use of cheaper flight prices. This is an intermediate level trip. To take part you should be at Fitness Level 2-3 and Tech Level 3 (see our Fitness/Experience guidelines below). You need previous ski touring experience to join this tour – if you are a strong/fit skier, just a few previous days ski touring will be enough. The week includes 5-6 hour days with generally steady climbs, but also some steeper terrain involving kick turns and the odd short boot track to reach summits. Typically we’ll be doing 800-1200m of ascent a day (but this is at at sea level, with day packs on) – so you can expect to be skinning for 3-4 hours a day. Type of ascent: we use 100% skinning on this tour – approx 5000m of skinning up, 5000m of skiing down, all at sea level. The hotel offers twin ensuite rooms, great food and an excellent spa area (with sauna, steam room and jacuzzi etc) which is open to guests each evening – there is also an open air hot tub available too. The accommodation is fully catered, with breakfast and evening meals taken at the on site restaurant and also includes a packed lunch each day. Hotel details can be found on our Accommodation page. Fly from UK to Northern Norway, meet your guide at the airport and drive to our hotel. Evening Briefing – your guide will run through kit checks and safety routines, before going on to discuss the current weather and mountain conditions and how these affect our plans. We’ll have maps and information on the area to show you, so if you’ve any further questions or last minute requests, then this is the ideal time to bring them up. A wide variety of day tours are available, skiing from summit to sea. The area is home to dramatic coastal mountains and numerous offshore islands – some of the larger ones are accessible by bridges and offer great ski touring. Needless to say, photo opportunities are excellent and we always stop to take shots of scenery and wildlife along the way. Further inland, we have access to higher inner alpine summits around the Svartisen National Park – this area offers quite a different climate, being a far colder and drier continental snowpack, with views of distant icecaps and high arctic tundra scenery. Outings are selected to cater for group interest, ski ability and the current snow and weather conditions. During the trip, we stay at a comfortable hotel 30km from Bodo. Saltstraumen is the world’s strongest tidal maelstrom – four times a day, up to 400,000,000 cubic metres of sea water are forced through the 150m wide channel between the inner and outer fjord, creating huge whirlpools up to 10m across. These maelstroms have an almost hypnotic beauty, as they constantly swirl and evolve their way down the channel. The huge tidal current is a very impressive sight, best viewed from the banks of the fjord or from the road bridge above – luckily, both locations are just a couple of minutes walk from our hotel, so the maelstrom can be easily viewed and photographed during the week. The Aurora Borealis – or Northern Lights – are one of the elusive, magical sights of the Arctic. There are plenty of good, dark locations to view and photograph the Northern Lights near to our accommodation. Don’t forget to bring a warm down jacket, as it gets very chilly on a clear, cold night! Caused by high energy particles from the Sun interacting with Earth’s magnetic field, they are most likely to occur in the first part of the night in the northern half of the sky. Nowadays there are Aurora forecasts available on the internet, in order to increase your chances of witnessing this unearthly natural phenomenon. Early transfer to airport, flights home. Your course meeting point is Bodo airport (BOO). Fly to Oslo, with connecting flights on to Bodo (same airline). Your guide will collect you from Bodo airport at 19.30 on Friday 15th March 2019, and drop off the following Friday morning 22nd March, in time for return flights from approx 5.30am. Please do not book flights arriving later than the pickup, to avoid the rest of the team having to wait too long! For transfer to hotel and travel during the trip, your guide will drive the team in a 9 seater minibus. Norwegian offer various flights from the UK including London Gatwick, Manchester and Edinburgh via Oslo, which all arrive in Bodo at 19.00. SAS offer flights from Aberdeen, which arrive in Bodo at 18.55. Check the Sky Scanner flight comparison site for your best option. Please visit our Equipment Hire page for recommended hire shops in your resort, and Alpine Guides hire equipment price list.